Competitors in the inaugural MLF Bass Pro Tour event at the Kissimmee Chain of Lakes will be on the hunt for vegetation holding pre-spawn bass. 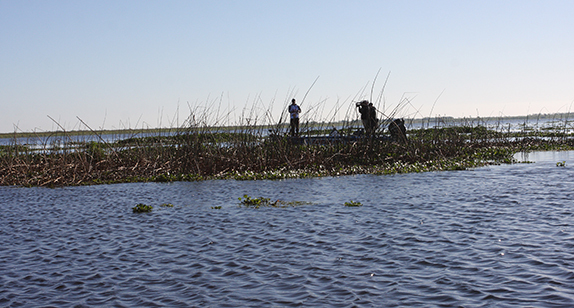 When the first cast is made tomorrow morning at roughly 7:30 a.m. EST somewhere on the Kissimmee Chain of Lakes in central Florida, the landscape of professional bass fishing will have officially shifted. That much we know. Beyond that, it's pretty much a blank slate. Since its announcement 4 1/2 months ago, Major League Fishing�s Bass Pro Tour has stirred up the waters of the tournament world, attracting a star-studded field of 80 anglers, including some of the sport�s most accomplished performers, in an effort to push the sport to new heights and reach a broader audience. Naturally, many questions followed the circuit�s formation. On Tuesday, the bright lights come on, the ScoreTracker starts to populate with catches and some of the questions can start to be answered. The competition format � every fish weighing 1 pound or more will count toward an angler�s daily weight � will create a much different playing field than what BassFans and some of the anglers are used to seeing at traditional top-level tournaments. Organizers are certain it will amp up the excitement and intensity. No longer will anglers have to take time to cull smaller fish since every fish is released immediately after being weighed. Heck, livewells in Bass Pro Tour anglers� boats can now be used for tackle storage. The level of experience with the MLF format within the field ranges from never played the game to seasoned veterans who�ve competed in every MLF Cup since 2011. That alone will be a storyline to watch as those new to the live leaderboard and everything-counts dynamic wrestle with decisions they�ve never had to make before. As always, the venue and daily conditions will eventually become the main topic. The Kissimmee Chain has been a regular stop for B.A.S.S. and FLW over the years, especially in late winter/early spring as the Florida-strain bass have spawning on their minds. Several anglers in the field have notched victories there in the past, with the most recent triumph credited to Bobby Lane, who captured a Bassmaster Open win there in February 2018. This week, practice was highlighted by a dreadful, day-long rainfall on Sunday and cool (high of 57), overcast day Monday. With temperatures expected to reach the high 60s Tuesday for the inaugural day of competition, it could pull the cold front-wary Florida-strains out of the doldrums. After another cold spell Wednesday and Thursday, the forecast calls for a warming trend heading into the weekend, which could dramatically change what anglers are focused on, especially if the water temperatures begin warming and fish start moving toward their spawning habitat. Add it all up and it�s not necessarily the preferred scenario, says Florida native Terry Scroggins, who rated the current fishing conditions �probably a 1 or 2� on a 1 to 10 scale. �We�ve got water temps in the 50s and while that might not seem that bad anywhere else, here in Florida that�s terrible,� he said. When reached after practice Monday, Fred Roumbanis wasn�t sweating all the uncertainty. He was on the hunt for his favorite pre-tournament meal. > 80 anglers are split into two 40-man groups (click here to see the group breakdown). > Group A will compete Tuesday and Thursday; Group B will compete Wednesday and Friday. > Each competition day will start at 7:30 a.m. and be broken into three 2 1/2-hour periods with 15-minute breaks between periods, during which anglers cannot run to a different spot. A 30-minute run-through period will be permitted prior to lines in (for more about the Bass Pro Tour rules, click here). Lines out for the day will be at 3:30 p.m.
> The top 20 finishers from Group A (cumulative weight from Tuesday/Thursday) and the top 20 finishers from Group B (cumulative weight from Wednesday/Friday) will advance to Saturday�s Knockout Round, for which weights are zeroed. > The top 10 finishers in the Knockout Round (one-day weight) advance to the Championship Round on Sunday, Feb. 3. > The Championship Round will take place at Lake Garcia, which was one of the venues used during the 2018 MLF World Championship, won by Greg Hackney. Weights will again be zeroed and the angler with the highest weight total at Garcia will be the winner. Matt Lee says not having to be back to the ramp for an afternoon check-in will take some getting used to. > According to BassFan research, the average size of a bass caught in the 13 MLF Cup events that have aired (two more will air this year) has been approximately 1.76 pounds. > The average bass has exceeded 2 pounds at just two of the 13 events, with both taking place in Alpena, Mich.
> The average age of the field is 42.89 years. > The combined career earnings of the 80 competitors from B.A.S.S. and FLW is $130.2 million. > The average career earnings of the 80 anglers is $1.6 million. > Of the 80 competitors, 55 have eclipsed the $1 million career earnings mark. Before getting into more about the bite, here's the lowdown on the venue itself. > Weather: Winter is still in full swing and after a rainy start to practice; a big cold front is set to swing through on Wednesday. No longer do anglers need to monitor fish in their livewell. No longer do they have to return to a predetermined checkpoint at a certain time in the afternoon. They�ll have two 15-minute breaks during the course of the day where no fishing is allowed. And they get a day off during the week. The Bass Pro Tour will represent a massive change in how competitors approach a day on the water and a tournament week as a whole. Nothing against the old way of doing things, but a new normal is about to leap across the front deck of the 80 competitors starting tomorrow. �I�d be lying if there wasn�t a little fear of change,� said Alton Jones Jr. �I�ve been going off one format my whole life from kids' tournaments to where I was, and that all has to change. It�s going to be different mental preparation and I�m going to try to not focus so much on the different format and focus on catching as many as I can and as many big fish as I can. Former Tour pro Art Ferguson III, whose Art of Fishing guide service takes him all over central Florida in the winter, says the bass are pretty conditioned to a pattern of warm days being interrupted by a cold front this winter. As a result, nothing has been consistent in terms of patterning the fish. He says there hasn�t been a major spawn yet, to his knowledge, and he can�t foresee a big wave of fish moving up with the conditions that are predicted. That�ll leave competitors hunting for areas with concentrations of fish, however, Ferguson says the schooling bite could be something to rely on. Terry Scroggins says the cold front that's hit central Florida this week has had a severe impact on the fishing. �Guys will be catching big fish by targeting them, but schooling fish could dominate this tournament,� he said. �They�re still running around in schools and that�s the nice thing about Florida-strains. They�re schoolers and they run in big numbers. Ever since the historic Bassmaster Top 150 event at Lake Toho in 2001, when Dean Rojas sacked a record 45-02 limit and Mark Davis also weighed in 41-10, the wait has been on for another perfect storm spawning scenario in Florida. Ferguson isn�t predicting anything extraordinary to happen this week, but the ingredients are there for conditions to get right later in the week. As far as the lakes in the chain, he says they�re in excellent condition and with the Florida Fish and Wildlife Commission recently announcing a moratorium on spraying aquatic vegetation, the fish should have ample habitat to roam in. He said if he were competing this week, he�d have a milk run set up rather than settling into one lake or a particular area. �With only 40 boats, I�d be covering some water,� he said. For the Championship Round on Sunday, the scene will shift to the east and Lake Garcia, a flooded former horse farm and orange grove that�s pretty uniform in depth (3 to 4 feet) aside from a few irrigation ditches and roadbeds. A canal connects Garcia to the famed Stick Marsh. The reason for the final round being moved off the Kissimmee Chain is practice for the Kissimmee Chain FLW Tour begins Sunday. According to Elite Series pro Kyle Monti, who fishes Garcia regularly when he�s not guiding at Lake Okeechobee, Garcia can fish much like Lake Kissimmee. 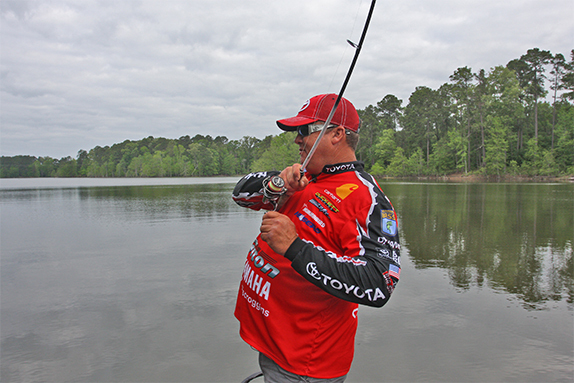 Being as shallow as it is, Garcia�s bass are also susceptible to cold fronts. �Sunday was the wettest day of practice maybe ever for me. I just tried to be as efficient as I could with the weather we had. The problem was it was so windy and rainy, so much stuff was unfishable. I still feel like you always get something out of every day of practice regardless of the conditions, whether that�s eliminating spots or finding a spot or two. I caught a couple, but nothing spectacular. �I was focused on trying to figure out areas I need to fish and not worrying about getting back to the ramp on time. Ott DeFoe could be a threat to contend this week based on his MLF history and pattern of success in Florida. �With the no-info rule, it seems the guys I interact with the most, we talk more just to escape the boredom. I will say it has been weird not knowing how many bites your buddies are getting. There are just a lot of unknowns. I know I�m heading to Hatchinea and Kissimmee and will stay in that zone the whole time. Finding areas to have confidence in is key. �I was breaking in my boat for the first time Sunday, so I�ve had to make sure everything is set up properly. It was nice getting off the water at 4 today. Otherwise I�d be putting on decals until late tonight. Now I�m ready to go. �My whole career, I�ve been geared toward catching the five biggest fish I can find. Now, every fish counts and we�ve got a severe cold front which is not a good situation in Florida. Either way, I�m looking forward to it. They turn off and on like a light switch. Right now, it�s tough, but as soon as it warms up, it can get good in a hurry. At the same time, it can get bad in a hurry, too. Here are a handful of anglers who might fare well considering the way the Kissimmee Chain is set up this week. > Bobby Lane (Group B) � He�s in his backyard and he�s played the MLF game since its inception, so he�s no stranger to the kinds of decisions that need to be made on the fly. He has a B.A.S.S. Open title to his credit on the same chain of lakes from last year. 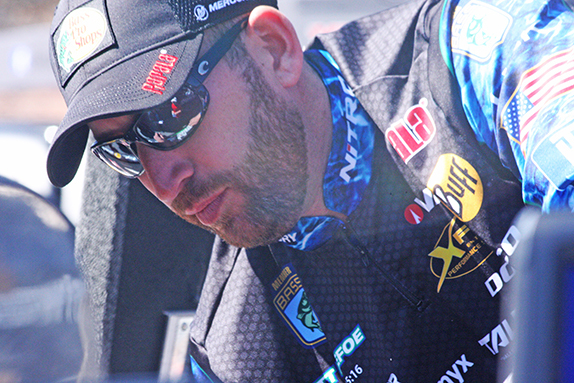 > Ott DeFoe (Group A) � One of the most consistent anglers on the Elite Series will try to bring that same steady performance to the MLF platform, where he�s enjoyed some success. > Jacob Wheeler (Group A) � He�s the top-ranked angler in the current BassFan World Rankings for his performance in traditional tournament formats, but he�s excelled in MLF competition, too. He has a knack for being able to develop 1-2 punches that deliver numbers and size. > Alton Jones (Group B) � An MLF original, he�s a noted sight-fisherman but can also play the numbers game. 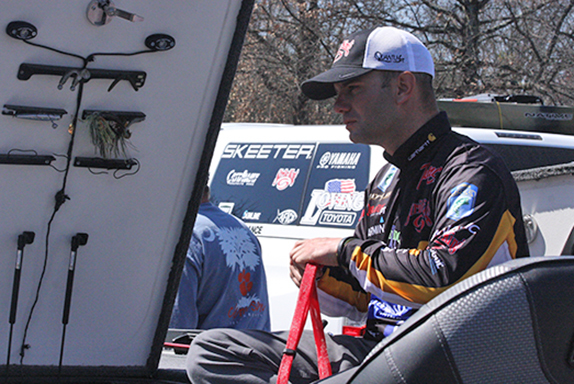 He won two rounds of the only MLF Cup held in Florida (Lake Istokpoga) back in 2013. > Michael Neal (Group A) � One of 12 former FLW Tour anglers in the field, he�s one of the top anglers going without a major win to his credit. Not much rattles him and that�ll be important under this format, which he�s familiar with from his time as an MLF Select competitor. > Anglers will launch at 6 a.m. EST at Lake Toho Marina (69 Lakeview Dr., Kissimmee, FL). After a ceremonial first cast by Bass Pro Shops founder Johnny Morris, lines in (first cast) will be at 7:30 a.m. First period ends at 10 a.m. Second period will be 10:15 a.m. to 12:45 p.m. Third period will be 1 p.m. to 3:30 p.m.
> The MLF NOW! live stream (10 in-boat cameras) will begin at 10 a.m. at MajorLeagueFishing.com and continue until 3:30 p.m. A post-game show will take place from approximately 5 p.m. to 7 p.m. and also be streamed on the MLF website.